To read about our wide range of replica military war medals, click the above button for details on this page. Click the image below to view or purchase a display/travel case for full size and miniature medals. E-mail us for enquiries and quotes, click on image below. An automated email is sent immediately to those who have purchased from our Replica Medals website via our Paypal account or, have submitted an order form from the replica medals web page or, sent an email enquiring about replica medals. When replying to such email be sure to change the Subject wording, for example ... 'Replica Medals Purchase Wally Stumpwater'.... . Do not copy and paste the example shown. If the 'Subject' wording remains the same, another of the automated email will be received by you. Monday to Friday ~ 8:30am to 5:00pm. Personal contact outside the above business hours can be by arrangement, including weekends. The Company website enables online transaction and communications 24 hours a day, 7 days a week. Automated email responses will occur, these will be followed up the next normal working day. Following email or phone communication about the medals, courier the medals to us to the Hamilton address in this page. An invoice is created and emailed to you, our bank account details on the invoice enable NZ bank to bank payment online or, the credit card payment process can be implemented as below. For domestic and international customers credit card payment, please indicate this and the means to do so will be emailed from our Paypal account. The invoice is receipted when payment is received. Work is scheduled when the medals have been received. Completed medals sets are despatched by signature-required courier within New Zealand and by airmail to international customers, the receipted invoice is enclosed. A new medal for New Zealand Defence Force (NZDF) personnel who have served in counter-piracy operations is now being issued, The New Zealand General Service Medal 2002 (Counter-Piracy). The New Zealand General Service Medal 2002 (Counter-Piracy) recognises members of the NZDF who have served for 30 days or more in counter-piracy operations in the Gulf of Aden, Western Indian Ocean, and off the eastern coasts of Somalia, Yemen and Oman, since 1 January 2009. Details of the medal, award eligibility, and applications by former NZDEF personnel can be viewed at the New Zealand Defence Force web page Breaking News. Medal mounting of war medals in New Zealand for WWI, WWII and post-WWII allies including British Commonwealth countries military medals for navy, army, air force war campaigns and defence force service. Other medal awards for mounting include New Zealand Operational Service Medal, New Zealand Honours such as Member of New Zealand Order of Merit, New Zealand Defence Service Medal, Pingat Jasa Malaysia medal and other campaigns. As New Zealand's leading medal mounting business, our constant aim is ~ Quality Assured ~ ceremonial excellence for Navy, Army, Air Force campaigns and defence force service. All medals fitted with original ribbon, sourced from New Zealand Defence Force on your behalf as required. Our fine-quality replica medals for purchase by you are also mounted for wear. All medals fitted with original ribbon supplied from our UK manufacturer, who supplies defence forces worldwide. To read the definition of swing and formal court mount styles, click here. All medals highly polished, and lacquered as is necessary for some medals. In February 2013, Her Majesty Queen Elizabeth II approved the Arctic Star, and the Bomber Command Clasp as two new awards for Second World War service. Many New Zealanders who served on the Arctic convoys, or north of the Arctic Circle on other war duties, or who flew with Bomber Command during the Second World War - or their families - may be entitled to apply for these awards. Further information is at the New Zealand Defence Force medals site: Medals News - 15 April 2013. Further information for United Kingdom WWII personnel is at the Veterans UK site - 15 April 2013 . Firstly, the proprietor of nzmilitarymedals.com has many years service in the New Zealand Army regular and territorial forces. His service includes Malaysia, Borneo and South Vietnam with an infantry rifle company. Qualified as a first class All Arms Instructor he knows and understands ceremonial protocol and military medal awards. Secondly, our professional medals processing techicians perform all medals mounting services to an exacting standard with quality products and materials obtained from reputable sources worldwide. The medals shown below indicates the quality of work by our Medals Processing Technicians in restoring your medal sets to a pristine condition after we have received them.Click images to enlarge. More than 30 years experience in mounting war campaign and award medals, plus 10 years army service that includes Malaysia, Borneo, and South Vietnam gives us the cutting edge to ceremonial excellence for mounting medals in court and swing style. Personal name label: We will print a label FREE, with the individual service number, last name, initials, Corp and/or branch of military service. The branches are Navy, Army and Air Force. The label will be fixed to the back of each set of court mounted medals, or sent separately. Be sure to send personal service details with the medals. The GST inclusive mounting cost per medal is for materials, labour, and quality workmanship. The supply of a brooch bar with pin is extra. The return delivery is by signature-required courier, as an 'assurance'. An average signature-required courier charge is GST inclusive $8.00. If you have had your medals set mounted by other sources and they are in a sound state, and not finished with adhesive glues, or have adhesive tape affixed to the medals, contact us to discuss the rebated charge for remounting to fit the New Zealand Defence Service Medal. Ribbon used for all medals is sourced from the manutacturer in England who produces for the Briish Forces and other Commonwealth coutries. See the simple price schedule below to calculate the price per number of medals to be mounted. All are fitted with new ribbon, and polished for a lifetime of regular use at ANZAC Day parades, formal occasions, civic functions, funerals and suchlike. Full Size Original Medals Mounting GST Inclusive Price Schedule, as from 1 July 2017. When FOUR or more medals are mounted we will supply you the method and instructions to fasten medals to outer garments, as like members of Royal Households. This eliminates inserting a brooch pin through a garment. The method also eliminates suspending medals from a pocket holder, which can damage stitching on top pockets. The GST inclusive cost for mounting miniatures is GST inclusive $15.00 per medal, a pair of deluxe brooch pins is usually about $5.00, and signature-required courier $8.50. Courier charge does not apply where miniature medals are mounted at the same time as your full medals set. See the medal ribbon riband bar types available, starting from single-space upward. Click on any image for the listings and purchase web page. Click on a picture for the full accessories page. For miniature medal sets. Medium medals case. For up to 4 full medals. Large medals case. For 5 or more medals. Medals pocket holder. Holds medals in jacket top pocket. Convert the box into a display case for upto 4 full mounted medals and upto 8 miniature medals. Remove the box inner pad by pulling on the white tab attached to it, thereby creating a display case as shown in the images below. Click on an image to expand. Available as a full or miniature medal, the replicas are of the highest quality. Email us now with your requirements and a quote. Send your medals to us by courier standard post, courier is the safest means. Include your name and mailing address, and email address. Include the medal recipient's service details for the label placed on the back of court mounted medals and medals display cases. Please make cheques payable to Premier Strategics, include applicable packing and postage fee. I received the replica NZDSM medals and clasps in the post the other day, I have to say they look great, almost better than the original I have, worth every cent. Thank you, much appreciated. I received my father's medals today 14-02-12 at about 12:30 and they are great and a great service thank you very much. I wish all businesses were like yours, great. I'd just like to let you know that the replica medals arrived last Friday and we are delighted with them. They will be put on display with other Judson memorabilia we have in our collections. Albertland Museum and Heritage Centre, Wellsford. 21 Jul 2011. Mounted medals arrived yesterday. I am impressed with both the standard of your work and your efficiency in dealing with this matter from the other end of the country. J C, Mosgiel. 8 Dec 2010. Please accept the enclosed book as a token of gratitude for the professional job on my medals. Just want to let you know I have received both mine and my great grandpa's medals. Also want to thank you on what an amazing job you guys have done, the quick turn around, friendly comms, the work, the lot. I couldn't be more happier and thankful for your service. Much appreciated. Have an awesome long weekend and a happy Easter! S K, Christchurch. 16 April 2014. I'm calling tonight to let you know my medals arrived today. I am absolutely thrilled with the result, an excellent job. Thank you ever so much. In September 2011 I ordered some replica miniature medals form you. They are beautiful and got them put in a boxed frame and they look amazing thank-you! A family member has seen them and would like a copy for themselves. I have copied the correspondence from the order I placed with you. Could you please give me a quote for the same product I received. If you are entitled to New Zealand military medals, apply for them by writing to the New Zealand Defence Forces medals section. Contact details are shown below. Include your current address and contact phone number in all communications. All records for New Zealander's who served during WWI are held at Archives New Zealand, PO Box 12 050, Wellington. The New Zealand Defence Force medals office is accepting applications for the medal as descibed on the web page, seen by clicking HERE.. Applications can be submitted via the website link by clicking HERE. One or more clasps may be awarded with the medal. The number of clasps awarded to an individual will be determined by the type(s) of military service undertaken by the individual. The four clasps are: REGULAR (image shown above), TERRITORIAL, C.M.T. and NATIONAL SERVICE. Military campaigns New Zealanders have been involved in include the Boer War, World War I and World War II, in Japan as occupation forces following the Second World War, and the Korea War in the early 1950's. That was followed by the Malayan Emergency from the mid-1950's to early 1960's. In the mid 1960's New Zealanders were involved with Malaysia in its confrontation with Indonesia by active service on the Malay Peninsula mainland and in Borneo. Commitment to the war in South Vietnam was undertaken from late 1960's until the early 1970's. Other global issues involving New Zealand military forces have included Rhodesia, mine clearing in Cambodia, the Gulf War, peace keeping in East Timor and a combat force in Afghanistan. Overall, the major countries in which New Zealand Military forces have been engaged in outside the borders of their own country include France, Germany, Italy, North Africa, Burma, Southwest Pacific region, Korea, Malaya, Vietnam, Cambodia, Rhodesia, Middle East, East Timor, and Afghanistan. 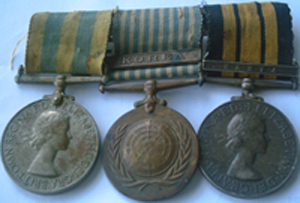 The system of medallic issue is based on Honours, Decorations, and Awards. The order in which Orders, Decorations and Medals are worn in New Zealand is prescribed Cabinet of the New Zealand Government. However, only medals approved by the New Zealand Sovereign, Her Majesty Queen Elizabeth II, may be worn by serving military personnel. Campaign Stars and Medals awarded for service in the Second World War. Check the order in which honours and medals are worn by clicking here New Zealand Defence Force medals. The insignia of any order, decoration or medal, including miniatures, lapel badges and ribbons, may only be worn by the person to whom they were awarded. There is a convention or custom that is widely understood that the next of kin and other relatives may wear, on the right side only, on ANZAC and similar days of remembrance, the service medals of deceased military personnel. The convention is a matter of personal discretion, is limited to days of remembrance and applies only to service medals and decorations mounted on a medal bar (full-size or miniature) and not neck badges, sashes and badges, or breast stars. When ribbons alone are worn, up to four ribbons can be mounted in one row on a ribbon bar before a second row centered above the first is started. The senior medal ribbon is displayed on the top row closest to the lapel and the junior medal on the bottom row furtherest from the lapel. We can advise on mounting and correct Order of Wear. The Court style presents your medals with ceremonial excellence! The style evolved from within the Royal Courts to eliminate the noise of medals clinking together as a wearer went about the court business. Hence, this style is the accepted standard for medals mounting that includes ensuring the medal itself is fastened. The swing style can contribute early damage to the face of medals and ribbon. Back to top of page. It is dictated by etiquette that medals be worn in court-mounted style when in Royal and Vice-Regal presence, and on full ceremonial occasions. Often there is doubt about the quality of a job when the owner sees medals mounted and overlapped. The simple answer is that a single group of medals should not exceed a width of 163mm. Thus, the normal ribbon is 32mm wide. An average group of five WWII medals mounted side-by-side, with tolerance for butting of ribbon edges, can equal 163mm. For six or more medals the group is overlapped to equal 160mm, on average. There are exceptions in order to maintain balance that include Honours, Decorations, and Awards for campaigns. 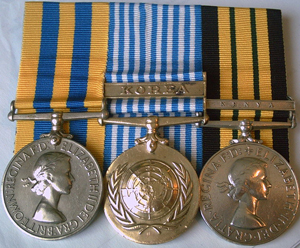 For example, the ribbon width for some Honours, Korean and Vietnam war medals is 35mm to 38mm wide. The length of a mounted military medal should not be less than 90mm, nor longer than 95mm. Requests for specifications outside these parameters will be met, however, please do not be offended if we point the preceding specifications in the first instance. There are two sides to a medal, the obverse side and reverse. The obverse side is normally referred to as the 'face' side and consists of depictions of a monarch or coat of arms. The reverse side can include depictions of a variety of symbolics. The correct order of medals mounting is the obverse side outermost, or to the front.